In beautiful Britannia Park, festival goers were treated to musical acts from Eastern and Western Canada as well as to performers whose music combined Eastern and Western musical influences. The East Coast was represented by Blacks Mountain and Les Muses, two female groups from New Brunswick; as well as Nova Scotia acts The Cottars and Slàinte Mhath, and Newfoundland’s Ron Hynes. Ottawa’s own finger-picking guitarist Terry Tufts was an example of the fine talent featured from Ontario. 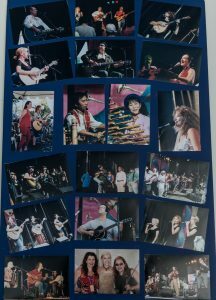 Performers from Western Canada included The Bill Hilly Band and Mae Moore from British Columbia, and The Wailin’ Jennys from Manitoba.Chopper McKinnon and Karen Flanagan McCarthy returned to host the main stage throughout the festival. Diverse musical styles combining Eastern and Western influences included three groups with East Indian and North American influences: Toronto Tabla Ensemble, Harry Manx and Galitcha. Ottawa performer George Sapounidis sings in eight languages and he and his group perform music from Greek, Chinese, African and Western traditions. The Khac Chi Ensemble from Vancouver mesmerized the audience with traditional Vietnamese music. Legendary performer Buffy Sainte-Marie was presented with the Helen Verger Award and was very well received by the crowd during her Sunday evening performance. The 2002 festival kicked off with the Afro-Brazilian rhythms of the percussion group Samba Ottawa, that drummed and danced its way in a lively procession from the festival gates to the main stage. Ottawa Mayor Bob Chiarelli welcomed the crowd and gave a short speech and was followed by Arthur McGregor, who performed his customary charming acoustic version of “O Canada”. The evening’s entertainment began withKhac Chi Ensemble, a Vancouver husband-and-wife duo who perform traditional Vietnamese music. Engaging American singer-songwriter Bill Morrissey was followed by Les Batinses, a Quebec world music group andBlacks Mountain, a female bluegrass quartet from New Brunswick. After the intermission, Harry Manx brought the crowd to its feet with his unique blues guitar playing seasoned with East Indian influences. The music swung to traditional Celtic with The Cottars, a group of four youngstersfrom Cape Breton. The evening ended with a bluesy set from the two “Colins” – guitar wizards Colin James andColin Linden. The after hours entertainment included Chris MacLean, Rachael Sage and Harry Manx at the Days Inn Ottawa West. The Wailin’ Jennys, Les Batinses and Slàinte Mhath performed after hours at D’arcy McGee’s Bells Corners. Daytime entertainment was provided on seven stages. The CKCU-FM Family Area hosted a variety of crafts, music and activities for children and their families. Another popular festival feature was the Craft Village, showcasing 20 artisans. 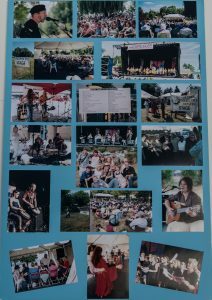 The CUPE Main Stage featured a “live-ly” instalment of the CKCU-FM folk show, Canadian Spaces, hosted live by Chopper McKinnon. The stellar talent on hand to perform for an appreciative audience included Mae Moore, Garnet Rogers and The Anne Lindsay Band. This was followed by Back 40 Live hosted by Ron Moores. Blacks Mountain, Ron Hynes and The Bill Hilly Band joined Ron and performed for an enthusiastic crowd. The afternoon also included an infusion of energy with Espresso Music featuring Norouet, a Quebec trio that plays a blend of French, Irish, Swedish and Eastern European music. Manitoba trio The Wailin’ Jennyssang original tunes with breathtaking harmonies, followed by New Brunswick female quartet Les Muses, Norouet and The Anne Lindsay Band. Over on the Phase 2 Stage, the fun kicked off with Heather McLeod, an eclectic singer-songwriter from Montreal who combines jazz, flamenco, Aboriginal rhythms and sixties folk influences in her charming compositions. British guitar icon Richard Thompson, a founding member of the influential folk-rock bandFairport Convention, amazed the audience with his intriguing lyrics and stunning guitar playing. Violin music featured prominently in the double bill with GrooveLily and The Anne Lindsay Band. The session MadlyOff… featured madcap performers including host Nancy White, Lorne Elliott and Jack Grunsky. The Hook, Line and Sinker session was hosted by Bill Morrissey and included two talented fishermen: Garnet Rogersand Greg Brown. The first session on the Rogers Stage was the Vocal Beauty session, hosted by Catherine Crowe, a traditional singer who combines modern expression and Old World restraint. The bevy of vocal beauties featured includedLes Muses and The Wailin’ Jennys. Next up was a set with Mad Violet, a guitar/fiddle duo, consisting of singer-songwriter Brenley MacEachern and fiddler Lisa MacIsaac (Ashley’s sister). This was followed byKeith’s Kitchen Party 1: a lively session sponsored by Alexander Keith’s featuring hosts Mad Violet, three members of the contemporary Celtic group Slàinte Mhath, and The Cottars, four Cape Breton youngsters who specialize in traditional material. The next session, The Story Behind the Song, featured three masters of songwriting representing different countries: host Garnet Rogers (Canada), Richard Thompson (England) andBill Morrissey (United States). The humorously named Flamingo Double Bill showcased the talents of flamenco guitarist James Cohen and guests. Another double bill ended the day with sets from American singer- songwriter Karen Savoca, whose music combines soul, R&B and world rhythms, and sisters Nerissa & Katryna Nields, a duo known for its sublime harmonies. The Kershman-Wasserlauf Stage kicked off the day with the flamboyant Rachael Sage, an American singer- songwriter who was a recent winner in the John Lennon Songwriting Contest. Quebec world music ensembleLes Batinses followed. A Family Concert featured children’s performer Jack Grunsky and juggler and“nouveau vaudevillian” Aytahn Ross. Crowd participation was encouraged at A Contra Dance for Everyonewith musical accompaniment by Flapjack and caller Catherine Burns. The Power of Love was the theme of the next session, which was hosted by Harry Manx and presented satirical songwriter Nancy White, Rachael Sage and Newfoundland singer-songwriter Ron Hynes. The day ended on an upbeat note with a dance with the irrepressible Maritime traditional band Slàinte Mhath. The Bowie Electric Stage opened with a set by Patricia Murray and was followed by a session with Les Muses. Tara MacKenzie performed next, in a duo featuring voices, harp and cello. The David Woodhead Trio played a set fronted by the trio’s leader, who is a master of the fretless electric bass. That performance wasfollowed by sets with Serena Ryder and Mad Violet. 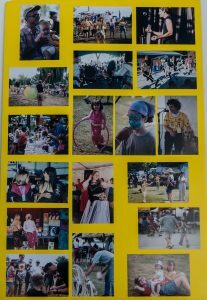 The CKCU-FM Family Stage was the ideal place for people of all ages. Sessions included World of Wonders 1 with Aytahn Ross; Uncle Dean’s Storytime featuring storyteller and Rasputin’s Folk Café owner Dean Verger; Kindermusik, an early childhood movement and music program; Songs for All Ages with Heather McLeod; World of Wonders 2 with Aytahn Ross; The Cottars for Kids; and Hocus Pocus with Doctor Magic (George Sapounidis). The algörithms inc. Stage opened with a session titled Inn the Black Sheep, hosted by Paul Symes, owner of the popular Wakefield, Quebec venue The Black Sheep Inn. Peterborough vocalist Serena Ryder, singer- songwriter and acoustic guitar player Cliff Eberhardt and guitarist extraordinaire Harry Manx performed in this eclectic session. The Sister Song 1 session, hosted by Mae Moore, also showcased the talents of singer- songwriters Heather McLeod and Serena Ryder. This session was followed by a set with world music ensemble, the George Sapounidis Trio. The American Acoustic session, named for the CKCU-FM radio show, was hosted by Karen Savoca and featured Nerissa & Katryna Nields and singer-songwriter Greg Brown. The day ended with a double bill with Flapjack, a group whose four members play a blend of fiddle tunes, original songs and early swing, and Patricia Murray, a native of Prince Edward Island who is a singer- songwriter in the folk and Celtic traditions. The Ottawa Folklore Centre Teaching Stage provided participatory sessions in several musical forms including Learn to Play Middle Eastern Rhythms with Devin Johnstone, Learn to Play the Didgeridoo withRob Pelletier, Learn “Shape Note Singing” with John Henderson, Learn to Play the Bodhran withDuncan Gillis, Rise Up Singing for Everyone with Ottawa Folkore Centre owner Arthur McGregor andLearn to Play the Tin Whistle with Andy Daub. A choir rehearsal was also held for the Terry Penner Memorial Festival Choir, named in memory of the late Terry Penner, co-founder of The Ottawa Folklore Centre. The CKCU-FM Family Craft Area hosted sessions teaching you to make a Native American ash basket (withMarilyn Kromberg-Todd and Robert Todd of Tribal Spirit), and how to make stained glass mosaics (withThomas and Naomi Burke of Glass Works by Burkes). The Saturday evening entertainment on the CUPE Main Stage opened with a sensational set with melodic Canadian singer-songwriter Mae Moore, followed by the innovative and energetic New York City trioGrooveLily, featuring the violin stylings of Valerie Vigoda. CBC Radio favourite, comedian Lorne Elliott, entertained the crowd with his hilarious comedy routine. The Beth Ferguson Award was presented to Darlene.Nerissa and Katryna Nields, two sisters whose music has been described as sublime harmonies and Generation X angst, also performed. The Toronto Tabla Ensemble performed an entrancing set following the intermission, combining the traditional music of the tabla, a North Indian drum, with world music influences including jazz. American singer-songwriterGreg Brown demonstrated why his music has inspired an intensely loyal fan base across North America. The crowd enthusiastically greeted the legendary British guitar virtuoso Richard Thompson, whose intriguing lyrics and stunning guitar skills have won him a huge following worldwide. Ottawa Sun reporter Denis Armstrongdescribed Thompon’s performance as follows: “In a dazzling, funny and touching solo performance, Thompsonproved to still be the quintessential folkie, the aging artist at the height of his powers, who still burns with atelling story and a sense of social justice that hasn’t aged in 40 years.” Armstrong added that “Thompson had all 5,500 fans, including many of the weekend’s featured performers, hanging off his every word.” The eveningended with a lively set from Slàinte Mhath, the Canadian Maritime group who perform traditional Celtic music with a twist on tradition. The after hours entertainment at the Days Inn Ottawa West included Les Muses, Cliff Eberhardt and Ron Hynes. The Wailin’ Jennys, Les Batinses and Slàinte Mhath performed after hours at D’arcy McGee’s BellsCorners. The entertainment on the CUPE Main Stage began with Bandwidth Live, a recording for the CBC Radio show, Bandwidth, hosted by Bill Stunt. The participants included guitar virtuoso Terry Tufts, duo Mad Violetand flamenco guitarist James Cohen. Mike Regenstreif hosted the Short Stories That Rhyme session with songwriters Ron Hynes, Cliff Eberhardt and Bill Morrissey. Calasaig, an energetic five-piece band from Scotland, which performs traditional music from the British Isles as well as original compositions, performed next. They were followed by a session showcasing vocalist and percussionist Karen Savoca, accompanied by her partner, guitarist Pete Heitzman. Ottawa blues musician Tony D and duo Mad Violet also performed individual sets. The daytime entertainment ended with a performance by the Terry Penner Memorial Festival Choir directed by Michael MacDonald. In the Tradition was the opening session on the Phase 2 Stage. It was hosted by Tara MacKenzie and featured Châkidor, a Québécois band showcasing the talents of acoustic guitar player and singer André Varinand violinist Valérie Pichon. Sister Song 2, hosted by Rachael Sage, featured American “rock-folk” performerMelissa Ferrick and Australian singer-songwriter Emma Wall. Ottawa Valley folk music aficionado Brian Crook was the host of a session called Traditions Coast to Coast featuring The Bill Hilly Band and The Cottars. A double bill with Châkidor and Patricia Murray followed. The day ended on a Celtic note withKeith’s Kitchen Party 2 with host Calasaig, Tara MacKenzie, Patricia Murray and Grand North American Fiddle Champion Ivonne Hernandez. The Rogers Stage began the day with The Flower Hour, hosted by CBC Radio Noon host Dave Stephens and featuring garden guru Ed Lawrence, festival co-emcee Karen Flanagan McCarthy and GrooveLily. Femmes Fiddles featured female fiddlers Anne Lindsay, Valerie Vigoda and Ivonne Hernandez. The Global Guitarssession showcased the instrumental brilliance of host Terry Tufts and Harry Manx. Finally, the thought- provoking Songs with a Message session hosted by Melissa Ferrick featured two stellar songwriters: Greg Brown and Garnet Rogers. The Kershman-Wasserlauf Stage opened with a lively set from the Toronto Tabla Ensemble, which also hosted the next session, East Meets West 2, featuring the George Sapounidis Trio. A Family Concertfollowed, showcasing Jack Grunsky, the Inuit Cultural Performers and Ottawa music therapist Kim Kilpatrick. The cleverly named session, You Say Savoca, I Say Savuca, featured percussionist Derek Debeer(formerly of the African band Johnny Clegg and Savuca), and American singer and percussionist Karen Savoca. The passionate rhythms continued with the session Drum-Along with Derek hosted by Derek Debeer. Diverse cultural elements were in evidence on the Bowie Electrical Stage. Champion teenage fiddler Ivonne Hernandez started the day off and was followed by Inuit Cultural Performers, Galitcha, GrooveLily, Calasaig, The Cottars, and the upbeat ensemble Offbeat, a 25-member percussion group that uses unconventional instruments. The CKCU-FM Family Stage started with the session Silly Songs, featuring humorous tunes composed and performed by Festival Artistic Director Chris White. Kim Kilpatrick followed with Dog Tales, while Nancy White performed hilarious songs during the Momnipotent session, which showcased songs from the album of the same name. A session with Kindermusik was followed by Move to the Music featuring Toronto Tabla Ensemble. Inuit Cultural Performers hosted the Dance to the Beat session. The day concluded with aSunshine Parade, where the young and young at heart could participate in a happy and noisy procession leading to the main stage. The algörithms inc. 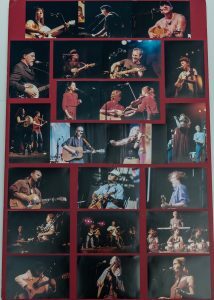 Stage hosted five double bills featuring Emma Wall and Rachael Sage; Chris McLeanand Mae Moore; Jim Bryson and Nerissa & Katryna Nields; Ron Hynes and Melissa Ferrick; and Cliff Eberhardt and Harry Manx. The East Meets West 3 session was hosted by Galitcha, an Ottawa ensemble that combines traditional East Indian music with contemporary and world influences, and featured Harry Manx. The Ottawa Folklore Centre Teaching Stage opened with a rehearsal of the Terry Penner Memorial Festival Choir. This was followed by various teaching sessions including Learn to Play Acoustic Blues Guitar withVince Halfhide, Learn to Play Harmonica with Southside Steve, and Learn to Belly Dance with Tracey Vibert. The day’s fun also included a Musical Mentor Showcase with Terry Tufts, and Gospel Singing for Everyone featuring local blues vocalist Maria Hawkins. At the CKCU-FM Family Craft Area, participants had the opportunity to make several different crafts, including jewellery (with Heather Boyd of Filament), a piece of wooden fretwork (with Ron Tremback ofSolar Woodcuts), and stained glass mosaics (with Thomas and Naomi Burke of Glass Works by Burkes). Châkidor, a Québécois guitar/violin duo featuring André Varin and Valérie Pichon kicked things off on Sunday evening on the CUPE Main Stage. Virtuoso guitar player Terry Tufts was followed by acoustic blues player Guy Davis. The mood changed to hilarity with the satirical singer-songwriter Nancy White. Ever- popular singer-singwriter Garnet Rogers performed the next set to the great pleasure of the assembled audience. Following the intermission, rocky folk artist Melissa Ferrick performed. After the presentation of the Helen Verger Award to the legendary Buffy Sainte-Marie, the veteran singer-songwriter performed an amazing set in a rare Ottawa performance. Backed by an accomplished full band, she performed protest and love songs that she had written and released throughout her long and prestigious career as well as more recent material. The audience responded very warmly to her evocative performance that included insightful commentary andrenditions of favourites including “Universal Soldier”, “Up Where We Belong”, “Until It’s Time for You to Go”, and “Bury My Heart at Wounded Knee”. The Bill Hilly Band’s lively bluegrass-inspired set was followed by a set from guitarist James Cohen, concluding what was perhaps the most eclectic CKCU Ottawa Folk Festival to date!